With its 25 national titles and 17 DFB-Pokals, FC Bayern Munich firmly belongs in the conversation about the greatest football clubs in the world. It is one of only three clubs to win all three major European trophies: the European Cup/Champions League, the Europa League and the Cup Winner's Cup. In addition to being undisputedly the most successful club in Germany, they are also ranked third on All-Time Club World Rankings. 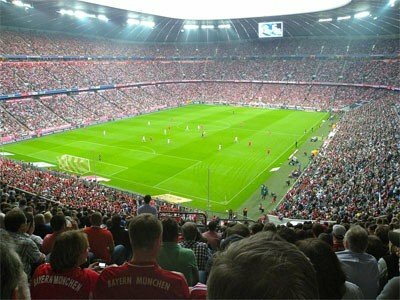 Bayern playing on the Allianz Arena. Strangely enough for such a successful club, Bayern did not set the world alight straight away. After being founded in 1900, the club had to wait until 1932 for its first national championship. One title could not turn their fortunes around, however; in those years, Bayern were derided as "the Jew's club", and many important Jewish club officials had to leave the country due to the rise of Nazism in Germany. The post-war era brought its own troubles, with the club being relegated in 1955 and narrowly avoiding bankruptcy at the end of the decade. The only bright spot for Bayern was winning their first DFB-Pokal in 1957. When the Bundesliga was founded in 1963, Bayern was not among the sixteen teams invited. Instead, they gained promotion two seasons later, led by three young players who would later be referred to as "the axis": Sepp Maier, Franz Beckenbauer and Gerd Müller. It was during their time at the club (1965–1979) that Bayern would finally turn into the powerhouse it is today. Those 14 years saw the club win four Bundesliga titles, four DFB-Pokals, a Cup Winners's Cup in 1967, as well as three straight European Cups from 1974 to 1976. The club's era of dominance continued with a team led by the dynamic duo of Paul Breitner and Karl-Heinz Rummenigge, often jokingly referred to as FC Breitnigge due to the club's over-reliance on them. Overall, the 80s were a time of huge domestic success for the club, which won six additional Bundesligas and three DFB-Pokals during this period. European trophies were harder to come by, however, as the club lost its only two European Cup finals in 1982 and 1987. In comparison, the early 90s were a time of turmoil at the club. After winning another title in 1990 and placing runners-up in the following season, Bayern ended the 1991/1992 season dangling dangerously close to the relegation zone. Losing to Norwich in the 1994 UEFA Cup was the final straw, and the club resorted to a change of personnel, appointing Beckenbauer as coach. Naturally, Der Kaiser proved himself a capable manager, and Bayern won its 13th title that same year, following it up with another one in 1997 and a DFB-Pokal in 1998. Ottmar Hitzfeld's appointment as coach at the start of the 1998/1999 season signaled the club's big return to the European scene. During his six years with the club, Bayern won a Champions League and further asserted themselves as the top dog in German football, winning four Bundesligas and two DFB-Pokals. In 2005 the team moved from Olympiastadion (built for the 1972 Olympic Games) to the new Alianz Arena. After the shift, Bayern Munich would continue share stadium with TSV 1860 Munich. Even though Bayern won seven additional Bundesliga titles and six DFB-Pokals in the years that followed, international success was once again proving elusive. After not getting past the Champions League quarter-finals in the period from 2002 to 2010, Bayern finally managed to win another competition title by defeating long-time rivals Borussia Dortmund 2-1 in the 2013 finals. The crest of Bayern Munich originally consist of the initials FCB.M. until a new crest was designed that has been modified many times. The current logo is somewhat featureless, but the colors used in the middle of the crest have a certain meaning being the colors of Bavaria's flag (Bavaria is the state in German where Munich is located). 1900 The club is established. 1932 First German football championships title. 1957 Winning their first DFB-Pokal. 1965 The first season in Bundesliga. 1967First European Cup Winners' Cup title. 1968 The first foreign player is transferred (Peter Pumm, Austria). 1972 The club move to the Olympiastadion. 2001 First Champions League title. 2005 The club move to the Allianz Arena.